In 1957, electricity poles were erected within the estate in preparation for power lines to be installed. 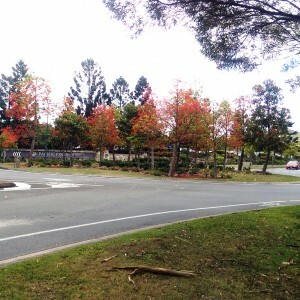 The suburb of Paradise Point is located on a peninsula of land bounded by Coombabah Creek, Coomera River and the northern Broadwater. The suburb also encompasses Ephraim and Sovereign Islands. 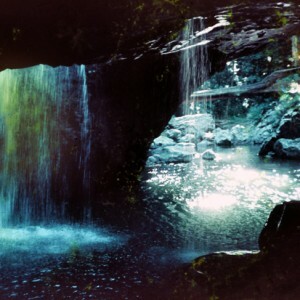 Prior to its subdivision and development, the area was a quiet fishing spot that could be reached by a track that went through swampy land that was studded with eucalypts. Following World War II, approximately 200 hectares of the land which eventually became Paradise Point was owned by Ralph Faulkinder who had acquired it for £600 from his deferred pay following the war. By the early 1950s, Faulkinder decided to subdivide part of his property. Jim Handford surveyed the land while Jack Kogler of Labrador was the selling agent for the new residential estate. The venture was managed by Willmore & Randell, who were experienced developers, with Mr Milton Grant acting as the local manager. Faulkinder eventually sold the land to Jays, a company owned by Handford and Kolger. In 1962, they were forced to sell some of their holdings but went on to develop the rest together until, in 1977, Handford acquired full control of the company. 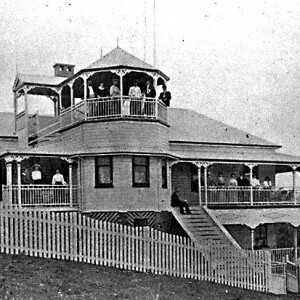 Over the years, Handford owned either independently or in partnership significant areas of land in Paradise Point including Sovereign, Andys and Griffin Islands and his home at the top of the point on 10.8 hectares of land where he operated a private airfield and golf course. 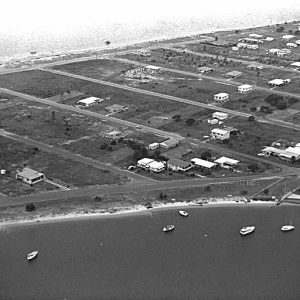 The first release of land for the Paradise Point subdivision, which was advertised as a township, occurred on 12 April 1953. The new development featured an Esplanade beside the protected waters of the Broadwater, waterfront allotments, ornamental parks, playgrounds and a shopping centre. The views over the Broadwater, excellent fishing spots and proximity to Hollywell provided additional appeal. The sale was considered a great success with all of the available lots selling within two weeks. A total of 122 blocks of land were sold in 1953 at a sale price starting at £40. By August 1954, three houses had been built and there were plans for a store and boating business to be opened by December. A further eight house were to be constructed in the following months. In 1957, electricity poles were erected within the estate in preparation for power lines to be installed. 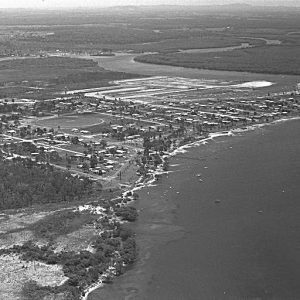 By 1959 more than 300 lots had been sold in Paradise Point. 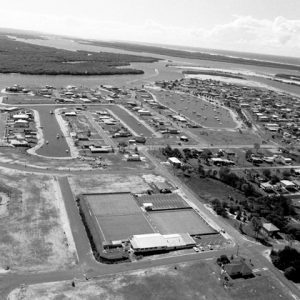 While the roads were advertised as being passable in all weather, it was not until a bridge was constructed over the mouth of Biggera Creek at Land’s End in 1960 that access between Southport and Paradise Point improved. The development was advertised at the perfect location for a holiday home and an ideal place to escape the crowds further south along the coast. As a result, Paradise Point was a popular choice for older retirees looking for a quiet home near the water. In 1970 the canal developments to the west of the Broadwater, known as Paradise Point Keys, were advertised for sale. The first stage of 135 waterfront lots sold out within a year and the second stage, which was a Lewis Land project, was advertised for sale in late 1971. Prices for a block of land on the canals started at $6,950. By 1983, Paradise Point had approximately 1,400 homes with more being built. With a growing community, the 200 members of the Paradise Point and Northern Districts Progress Association lobbied for improved amenities including a community centre, street lighting, parking areas, bike racks, a fire station, improved drainage and the Pine Ridge Environmental Park. Land was set aside for a police station. 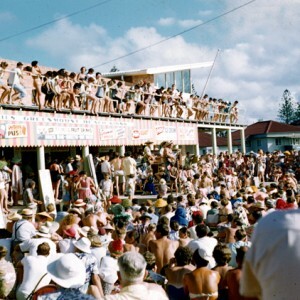 In 1986 Sir Joh Bjelke-Petersen opened the $3 million Haddon’s Marina at Paradise Point. 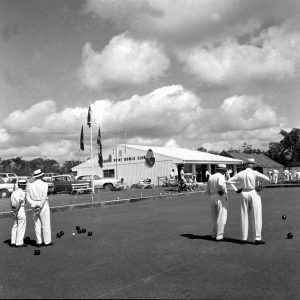 The marina had berths for 50 boats, supplied both equipment and boats for hire and was a departure point for boats travelling to Tipplers, North Stradbroke Island and Jumpinpin. 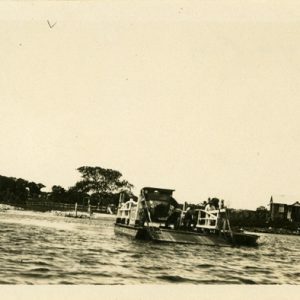 In later years Paradise Point was further transformed by the development of Andys and Griffin Islands into Sovereign Island and the subdivision of Ephraim Island into prestige waterfront housing with deepwater moorings capable of accommodating ocean cruisers. By 2016, over 9,000 people called Paradise Point and Hollywell home. “Paradise Point.” South Coast Bulletin (Southport, Qld.) 9 May 1956, p. 5. “A new town in the making on the Gold Coast.” South Coast Bulletin (Southport, Qld.) 14 Jan 1959. “Paradise Point Electric Light Assured.” South Coast Bulletin (Southport, QLD.) 23 Oct 1957. “Advertising.” Gold Coast Bulletin (Southport, QLd.) 17 Dec 1971, p. 41. Kennedy, Doug. “The Point – standing apart still.” Gold Coast Bulletin (Southport, Qld.) 14 Jun 1983, p. 4. “Gold Coast without High Rise.” Courier Mail (Brisbane, Qld.) 28 Dec 1981, p. 10. “The master of all he surveyed.” Weekend Bulletin (Southport, Qld.) 18-19 Jan 2003, p. 4. “The Point – Still Standing Apart.” Gold Coast Bulletin (Southport, Qld.) 14 June 1983. “It’s just the start.” Gold Coast Bulletin (Southport, Qld.) 8 Apr 1986, p. 2. “Marina takes on a new image.” Gold Coast Bulletin (Southport, Qld.) 6 Nov 1987, p. 47. “Broadwalk on track.” Gold Coast Bulletin (Southport, Qld.) 10-11 Aug 1996, p. 52. “Nautical feel to the streets of Paradise.” Gold Coast Bulletin (Southport, Qld.) 27 Aug 1998, p. 13. 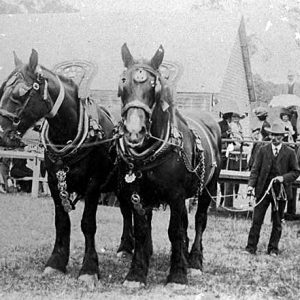 “Festivities for opening of the new-look village.” Gold Coast Sun (Southport, Qld.) 25 Nov 1998, p. 61. “Sovereign, a premier island address.” Courier Mail (Brisbane, Qld.) 5 May 2001, p. 16. “Paradise up for grabs.” Gold Coast Bulletin (Brisbane, Qld.) 18-19 Jan 2003, p. 5. “The master of all he surveyed.” Gold Coast Bulletin (Southport, QLD.) 18-19 Jan 2003, p. 4.